..................... |c| = sqrt(realc^2 - imagc^2) <= 2; default="-0.7,0.27015"
PURPOSE: To create a julia set fractal image. 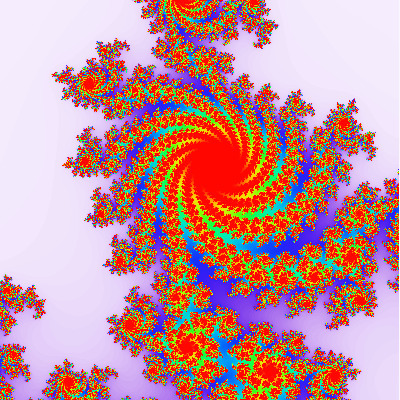 DESCRIPTION: JULIASET creates a julia set fractal image. The fractal is defined in the complex plane by iterating the expression, z^2 + c, where z=(x+i*y), i=sqrt(-1) and c=(creal+i*cimag) is a fixed complex value. The fractal may be zoomed in at any center coordinate within the WxH. The output image is colored by a color map according to the number of iterations needed to converge at each pixel. The background color (first color in the list) represents reaching the maximum number of iterations, which is 255. Otherwise, smaller number correspond more to the left in the color map and larger colors correspond to more to the right in the color map. -c constant ... CONSTANT is the fixed complex constant in the julia set expression where c=(creal+i*cimag) is expressed as a comma separate pair: "creal,cimag". Here creal is the real part and cimag is the imaginary part. The absolute value of c, |c| = sqrt(realc^2 - imagc^2) <= 2. The default="-0.7,0.27015"